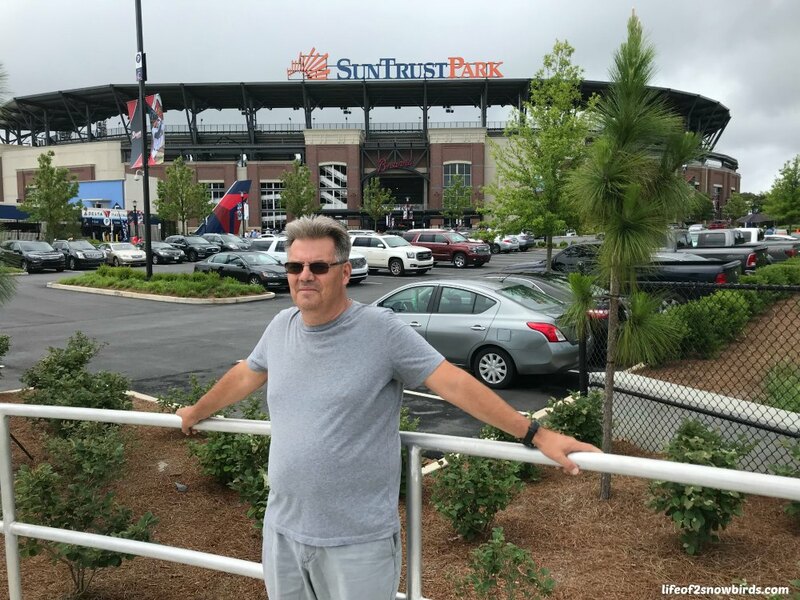 We planned a road trip to Atlanta, Georgia to watch our favorite baseball team, the Mets, play their away game against the Braves. We arrived the day before the game to make it a mini vacation. (You can read about our first day here.) We chose to stay at the Country Inn & Suites, Atlanta/Galleria, Ball Park because it was within walking distance of of the stadium. This made the hotel very convenient for us. They offered shuttle service to the stadium but we found out about it after the shuttle left! There's never any harm in getting a couple of extra steps each day so it was actually a good thing that we missed the bus. If we would have skipped the sightseeing we would have made the bus but then we would have missed out on seeing some awesome sights. We researched before we left on our weekend road trip and found a couple of things we had to see and do here. Our hotel was only a few miles from Martin Luther King, Jr. National Historic Park. This park spans about 35 acres and consists of several buildings and sites that includes Martin Luther King, Jr.'s childhood home on Auburn Street in the Sweet Auburn Historic District. 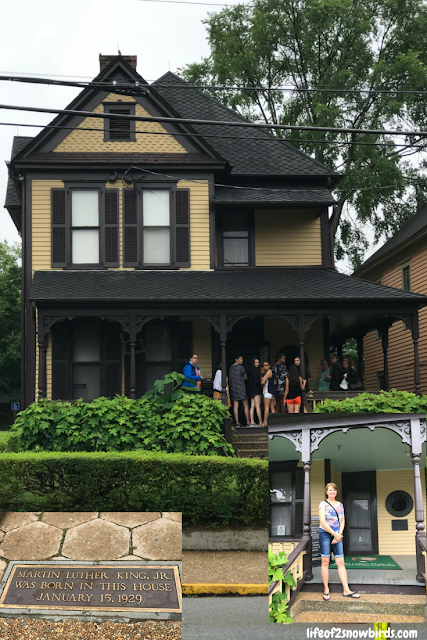 We didn't have time to look inside, which was free to do, but we were thrilled to just stand on the same porch where one of the greatest people in history once stood. 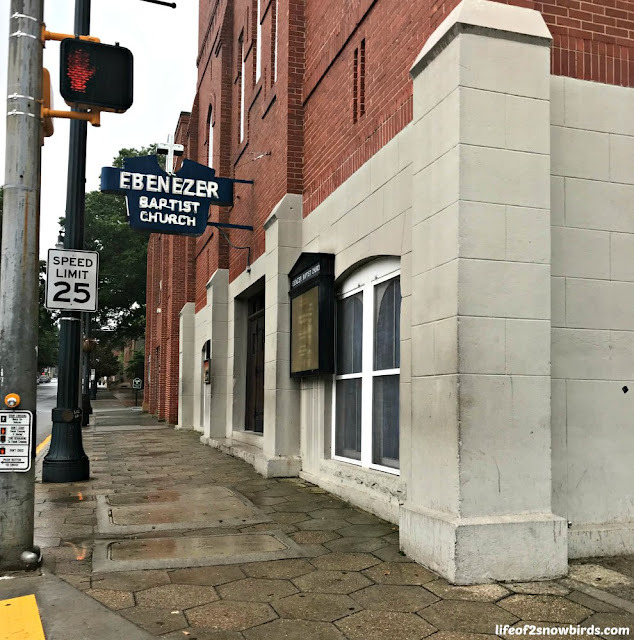 Down the block is Ebenezer Baptist Church where both Martin Luther King, Jr. and his dad, were preachers. Across the street from the church is the visitor's center which has exhibits telling the story of the Civil Rights Movement. 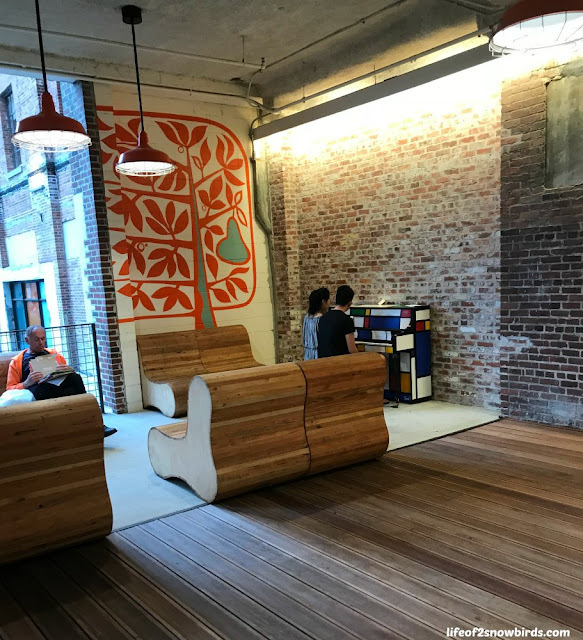 There is also a theater here and the D.R.E.A.M Gallery that holds exhibits that will change from time to time. You can pick up the free tickets to enter King's childhood home in the visitor's center here. 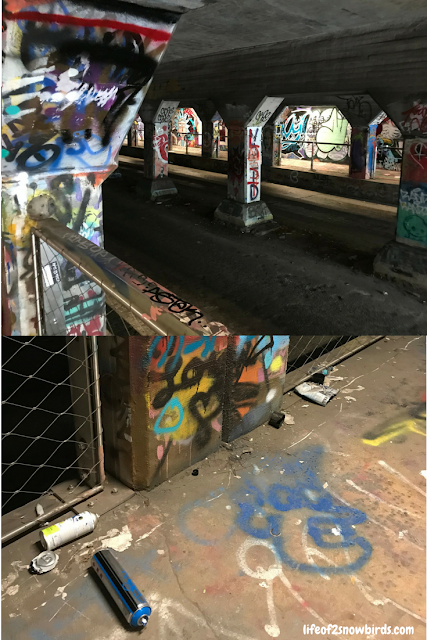 A few blocks away from the park was the Krog Street Tunnel. I was thrilled to find this tunnel as we love to seek out the unusual sights in a new city. This tunnel was perfectly quirky. If you are an artist with a paint can, you can display your art in this tunnel. It was so colorful and so fun and the paint cans thrown around throughout the tunnel just added to the ambiance of this place. 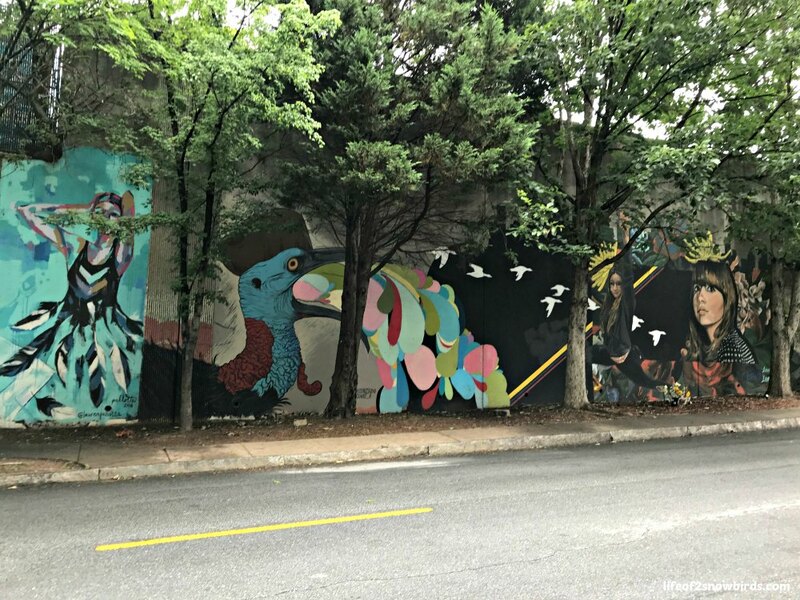 The walls outside the tunnel were also decorated with works of art and a couple of restaurants and stores in the few blocks surrounding the tunnel also got in the spirit and decorated their businesses with spray paint as well. Now it was time to get to the game. We went back to the hotel to drop our car off and walked up the hill towards SunTrust Park along with lots of other people doing the same thing we were. I had completely forgotten that the Braves fans were the ones who did the tomahawk chop when they were cheering for an amazing play. I remembered the rivalry the Mets and Braves had when I was a kid and how much that chop annoyed me haha! If the Brave fans were cheering, the Mets were probably in trouble! It all came back to me when we got to the stadium. Everything is about the chop. 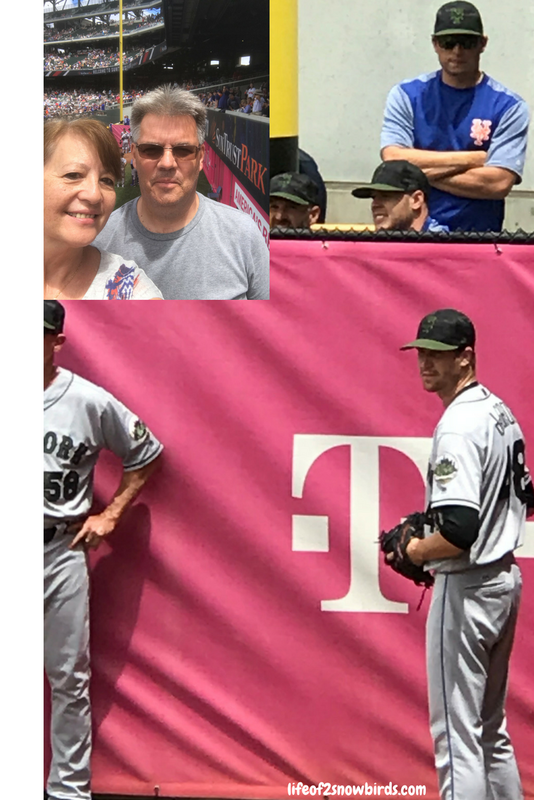 We had great seats and were able to watch the Met's pitchers warming up before they got into the game. 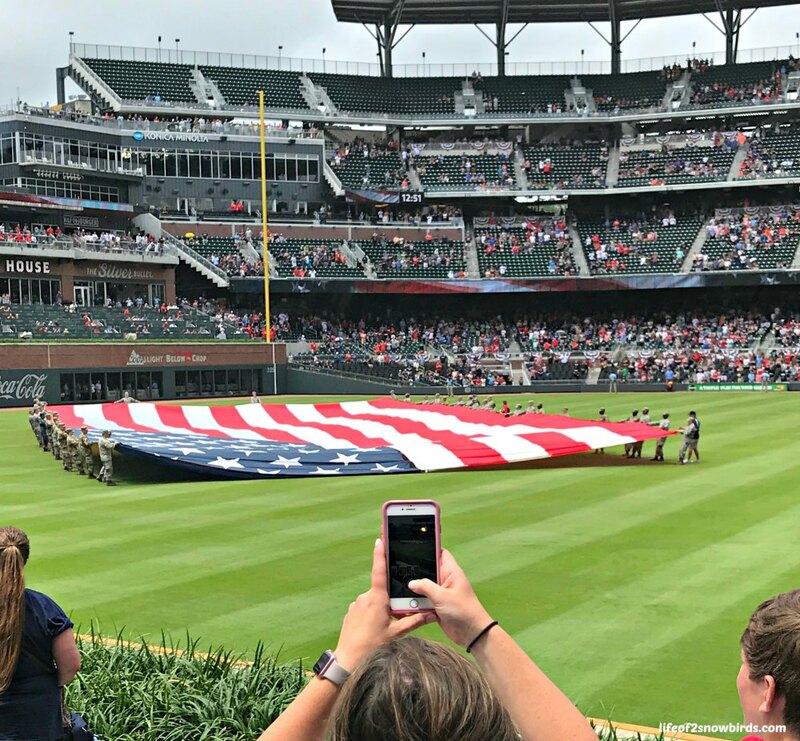 And because it was Memorial Day, there was a wonderful pre-game show honoring every branch of the armed forces and the brave men and women who serve or served in them. Throughout the game, between innings, individuals were singled out for either serving, formally serving or being the family of someone who gave their lives while serving. We saw their images on the big screen and gave them standing ovations. There were also taps and a moment of silence in honor of all those heroes who never returned from their tour of duty. Unfortunately, the Mets lost but we had fun in spite of the loss. The Mets hadn't been doing so well so we kind of expected it. We are fans for life, though, no matter how bad their seasons are. After the game we wanted to find somewhere fun to eat. There was a burger place in Atlanta that was recommended for us to try by our son Joe. He has made trips to some really out of the way places to try a burger he has read about so we trusted his suggestion. We found H&M Burger in Ponce City Market. 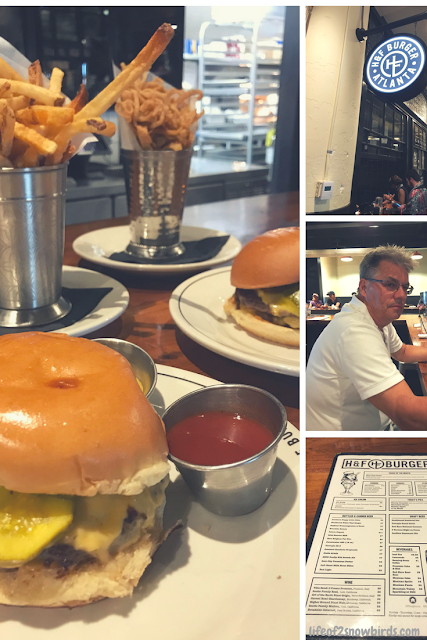 H&F Burger is where we could find the famous H&F burger that local chef and James Beard Award winner Linton Hopkins created. This burger was first served at Holeman and Finch Public House. There would be only 24 burgers prepared each night at 10 p.m. First come, first served. You would have to come back another night if you missed out. The original H&F burger is a double cheeseburger, topped with red onion and house-made pickles served on a freshly baked bun which is made to be the same size as the burger. It is buttered and toasted on a griddle before the burger gets to sit inside it. It is served with made from scratch ketchup on the side. We ordered french fries and shaved crisp onions to eat with our burgers. I have to say that this burger is on the top of my "best burger I have ever eaten" list. And the fries and shaved crisp onions were not too shabby either. We were on vacation so that means we could splurge on desert. I noticed something delicious that I had never had before, on our way over to H&F, and I had to have it. But first we needed to walk off some of the calories of our delicious dinner. We went window shopping and then checked out the rooftop area. We didn't, but could have had a cocktail up here while we relaxed and enjoyed the view. We passed an area with a piano and comfy couches and listened to a young couple playing Chopsticks. After our walk I was ready for desert! 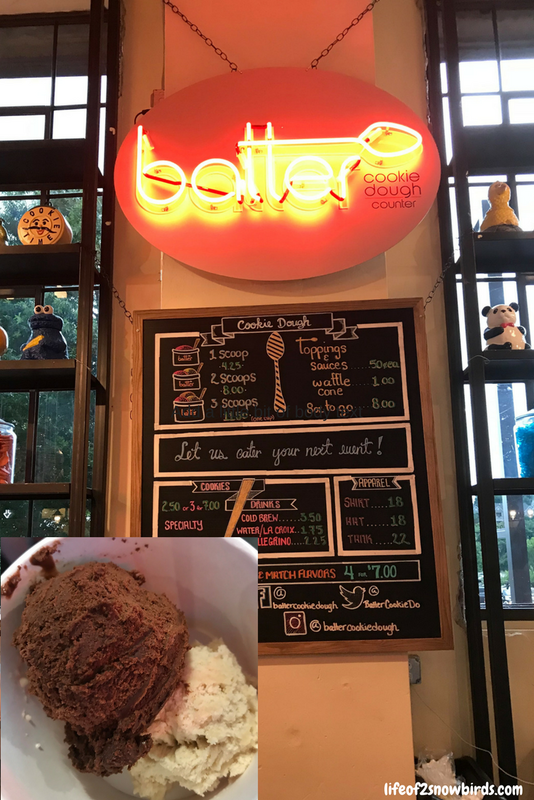 Batter Cookie Dough Counter served "cookie dough" that you could eat before it turned into a cookie. I've always thought that the best part of baking a cake or cookies is being able to lick the spoon that stirred the batter even though I know I am taking a risk of getting sick from the raw egg. I don't know how they did it, but you can eat the dough they sell here without worrying. I picked brownie batter and sugar cookie. They were yummy but a little too sweet. I would love to go back one day to test out the other flavors though! Needless to say, I was stuffed after all the eating we just did so it was time to head back to the hotel. We had a great time in Atlanta. We will be looking for another Mets game here in the future for an excuse to visit this fun city again! Hahaha! 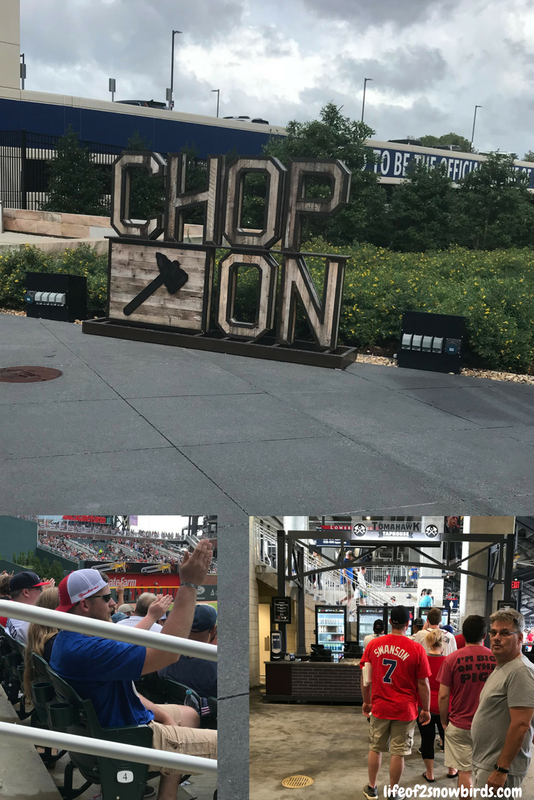 I loved hearing that the chop was a bit annoying even to a fan! Thank you so much for stopping by!! Thanks for the mini vacation to Atlanta! Haven't been except driving in the insane traffic to get to Florida from NY. Usually took 95 down but due to a hurricane a few years ago we had to divert from our usual route). Oh yes the METS: I'm sure you knew the Iconic Team Song “Meet the Mets” Turns 55 this year! Will have to check out the rest of your blog. Yes! Did you know the Mets recorded an album of all their "hits" hahaha! My friend still has her copy! I'm in central Florida (for 1/2 the year) also. If you come back to the blog, check out the post on murals in Lake Wales! Your trips always look like so much fun. Thanks for sharing on To Grandma's House We Go! Yes! We are so grateful that we are able to travel as much as we do! Looks like a fun trip and those burgers/fries look amazing. 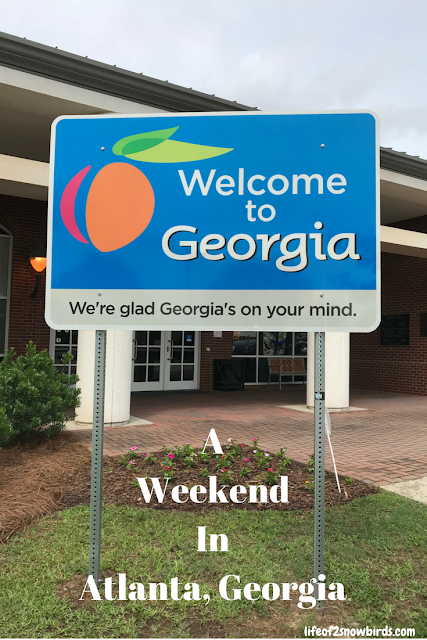 There are lots of fun things to do in Atlanta if you ever get a chance to go. Definitely have one of those burgers and the sides. They are worth the calories! Looks like a fun weekend. I love food and that burger and cookie dough place sounds fun. All of it was worth the thousands of calories! You are so lucky to be so close to Atlanta and all it has to offer! Thank you for nice comments! Found you on the Pretty Pintastic party - Since I'm getting ready to retire in a few years, I'll be following your adventures!! Aw! Thanks! I hope that you share your adventures with me also! 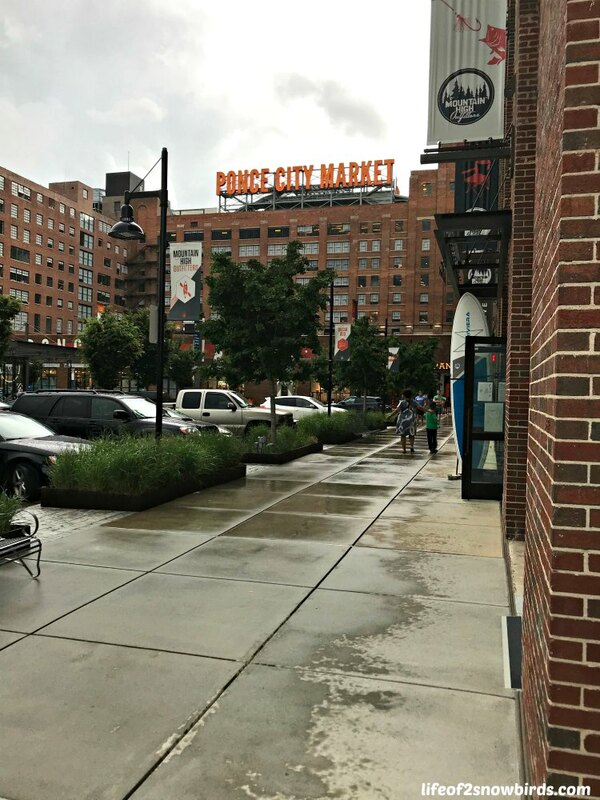 Great entry and virtual tour of Atlanta through your words and photos! Thank you and thank you for hosting your party every week! I went to Atlanta back in the early 2000's. The parts that I saw were really nice...except for the MARTA. LOL. so happy you had an awrsome time. Yes it was a fun city. I'm not sure what the MARTA is but I'm glad I didn't bump into it! I do love baseball and for years I religiously watched the Braves. But now, when I get the chance I stay much closer to home by watching our minor league team, Birmingham Barons, play. PLAY BALL! Watching the minor league teams are lots of fun. You are lucky to live near your team's. Thank you for stopping by! Looks like a great place to visit! I`ve never visited any of the southern states past Texas and I would really love to go. Thanks for giving me a taste of it. Welcome! Texas is definitely a place I would love to see! What a fun weekend. I haven't done the sight-seeing, tourist thing in Atlanta in way too many years. You know how it is when you have close friends and/or family in a city. You go to their home for an event and that's about it. I think Hubs and I need to sneak into Atlanta and do some fun sight-seeing like you did. Fun post. You are so lucky that you get to visit often! Hope you get to sneak away with Hubs one day to explore!! 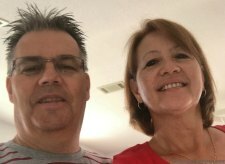 Found you on Blogging Grandmothers Group! Love the post about Atlanta. Hubby works there sometimes, and we love visiting local diners and unusual sites! Sounds like yall had a great time! Thank you. We did have a lot of fun in Atlanta. We hope to get back again one day. It's great for you that you get to visit often! Thank you for sharing!! We are used to the losing! We will always be fans though. I think you will have a great time!